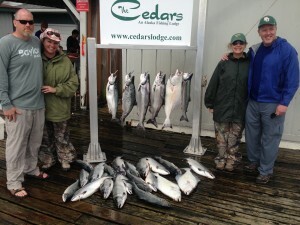 Our halibut season was consistent and as usual we were able to catch fish for almost every client. Unlike some years, we didn’t catch any really big halibut this summer. The biggest charter halibut we pulled up to the boat was probably in the 70-80 pound range. Like always, we try to keep halibut in the 15-30 pound range for our clients as these are best eaters and are very plentiful. Coho fishing was really good this year from the 1st week of July all the way to the end of September. We had brief windows where they would seem to disappear which required us to put more miles on the boat trying to find them. Several groups this summer came during the in-between times where we had to fish alot of different spots to try to find the Silvers. Although these days can be discouraging, its just part of fishing and some days you have to work for it. Thank you for being understanding during the moments when we are doing more fishing than catching! Pink fishing was good like it is most summers here: you can usually catch about as many Pinks as you want to. We had trips where we limited very quickly as some Pink trips where we just caught them consistently for 4 hours and ended up with a full box at the end of the trip. If your looking for almost non-stop action then Pink fishing in July and August might be the thing for you.